Whisk together xylitol, balsamic vinegar, extra virgin coconut oil, rosemary, garlic, and pepper in a large bowl. Reserve 1 tablespoon of marinade in a small bowl, and set aside. Add the salmon and toss to evenly coat. Cover the bowl with plastic wrap, and marinate in the refrigerator for 30 minutes. Remove the salmon from the marinade, and shake off excess. 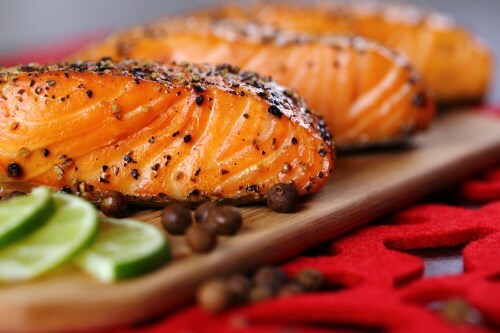 Place salmon in an aluminum foil-lined baking dish, and sprinkle with salt. Roast in the preheated oven until the fish is easily flaked with a fork, about 10 minutes. Brush salmon with the reserved marinade, and return to the oven. Roast until glazed, about 1 minute.